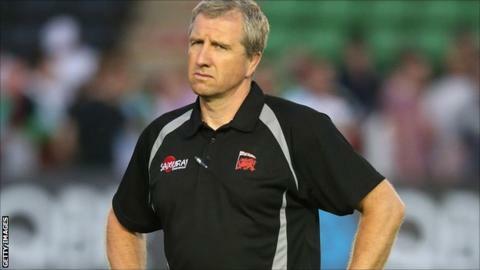 London Welsh director of rugby Lyn Jones paid tribute to his side after they earned their first ever victory in the Premiership on Sunday. Welsh beat Exeter 25-24 after losing their opening two top-flight games. "I'm delighted, I cannot express how happy I am," Jones told BBC Oxford. "It was a good performance and we've come away with a very good victory. "You can't coach guts and you can't coach determination and that comes from within and you saw that today." Jones says he never doubted his side despite their tough start. "We know we've got the right boys in the room and if you've got the right attitude and work hard then you'll get the rewards," he said. "We've got to take the win and savour it and use it to build confidence and become stronger. "The start to the season was challenging but today is a start to get on the board with four points and we can only move on from here." The Exiles next face Sale and Jones says they must now use Sunday's victory as a springboard. "We need to carry on developing our game and improving," he said. "The support here (Kassam Stadium) was very good and victories don't come around that often so we've got to enjoy them when they do."